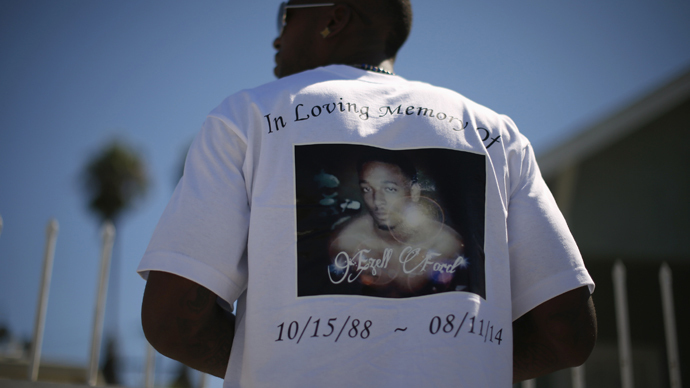 The Los Angeles police chief and an independent watchdog have both determined that two officers involved in last year’s close-range fatal shooting of mentally ill 25-year-old black man Ezell Ford were justified in their actions. The findings by LAPD Chief Charlie Beck and inspector general Alex Bustamante were confirmed to AP by a Police Department employee who spoke on condition of anonymity, because they were not authorized to release any details of the investigation. The finding currently only serves as a recommendation to the Police Commission. After a formal hearing Tuesday, the commission will finally have to state whether Ford's shooting was in line with department policy. Both officers have been pulled from field duty while the shooting is under investigation. The investigators have reportedly found evidence confirming the officers' claims that Ford had struggled for control of one of the patrolmen's guns, so they shot him. That evidence included Ford's DNA on the gun as well as a previously released autopsy report, which according to police, also appeared to support the officers' account. Ford was fatally shot by police near his home on August 11, after an“investigative stop”resulted in a“struggle”that saw Ford end up facedown on the ground. The inspector general has found that the officers' tactics were not flawless in the way they first approached the unarmed man. As the officers reached Ford, one of them put his hands on him — a move that Bustamante found unacceptable, given that in such situations officers are instructed to address a suspect from a “position of safety,” like behind an open car door, a source told Los Angeles Times. According to the newspaper, LAPD officials have never actually made it clear why the two officers, Sharlton Wampler and Antonio Villegas, stopped Ford in the first place. The sources told the newspaper the officers allegedly decided to detain the black man after they thought he was trying to throw away drugs. The department never publicly stated whether any narcotics have ever been found, however. The sources cited by the Times claim that Beck will recommend to the commission that the officers be cleared in all accounts, while the inspector general will allegedly recommend to fault the officers for their questionable tactics. The LAPD said that Ford was acting suspiciously when they approached him August 11. He allegedly knocked one officer to the ground and grabbed the officer's holstered gun when his partner fired two shots. The fallen officer pulled out a backup gun and shot Ford in the back, Beck stated last year. An autopsy into the killing confirmed that Ford was shot three times at close range, with two wounds being fatal. On top of it, the wound in Ford's back showed a "muzzle imprint," meaning that the shot was fired at a very close range. The man's death in the operating room just two days after the fatal police shooting of Michael Brown in Ferguson was classified as a homicide. Ford's killing also triggered protests and marches across LA. The parents of the victim, Edsell and Tritobia Ford, are suing the LAPD for $75 million for allegedly racially profiling their son. Ford suffered from schizophrenia, bipolar disorder and depression, and according to his family, the two police officers had allegedly known about it. In fact, one of the officers had arrested Ford six years earlier for marijuana possession, but did not recognize him during the fatal August incident, a police spokesman said in January 2015. According to the Los Angeles Times, which obtained a police report in Ford's previous arrest, Wampler and his patrol partner approached a car in 2008 because they allegedly smelled pot. They found marijuana and also arrested Ford's father and his brother at the scene, the paper reported. Ford was one of 18 people killed and nine others wounded in LAPD shootings last year, the department said, according to LA Times. As of June 1, police officers had shot and killed eight people and injured eight so far this year, the department reportedly stated.